Dungeon Scroll has entered the best selling app lists in the US App Store (other countries as well! 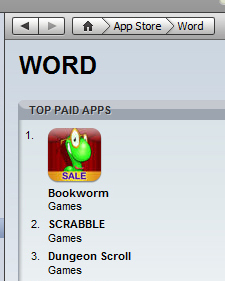 ): Word games: #3, Puzzle games: #15, All games combined: #91. It’s maintaining a healthy 4.5/5 star rating in the US App Store. So I didn’t let a giant bug slip in at the last minute, phew. That’s the worry that causes programmers to wake up in a cold sweat in the middle of the night. The PC version also lets you type on a keyboard to control letters which is amazingly fast – if you can type well. If Bluetooth keyboards or something are ever supported by the iPhone I’m going to add support for that ASAP. 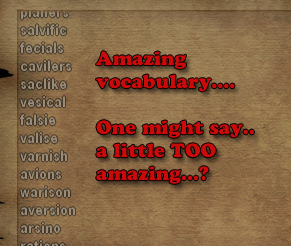 One of the issues with high scores and word games is they are pretty easy to cheat using software that helps you make words. Multi-player Chess or trivia games have a similar problem. Dungeon Scroll for iPhone includes an amazing amount of information on each game that you can examine and decide yourself if it’s “legit” score or not. Click the little “i” icon on a game you are curious about. 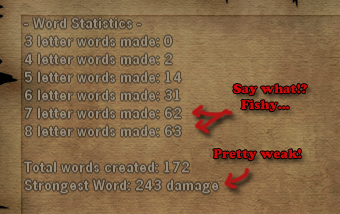 In the game details look at three things: Strongest word, 7 & 8 letter word count, the list of strong words itself. Well, what kind of words was he making? Maybe he’s just a genius? Yeah, that’s what I thought. Like a disgraced Olympian caught using steroids, the once respected youallsuck will be asked to return his gold medal. Now, I COULD erase the score manually (or automatically through a checking heuristic) but I find the easiest way is just to let it ride and have it drop off the list in a week naturally. This technique can also help you locate the mischievous on Dungeon Scroll PC. This entry was posted in Development/RTsoft on August 7, 2009 by Seth. Awesome game! Great fit for the iPhone. Well done, Seth. Congratulations on the great reviews! I would love to see more iPhone games from you in the future.